Today’s post is from my friend Stacy of Food Lust People Love. I was so excited that she and I had the chance to meet in person this May when I was in Dubai. Stacy graciously escorted me around to show me some of the sights and delivered me to the airport. I was excited when she chose to share this banana recipe as it’s one of the things I discovered from a street vendor in old Dubai. Basically, they’re delicious! You can connect with Stacy on her blog, Facebook, Instagram, and Twitter. Perhaps it’s sacrilegious to say but even as a non-Muslim, Ramadan in Brunei was my favorite month. I daresay most residents would agree with me. Night markets or pasar malam pop up everywhere with vendors selling colorful new clothes in preparation for Hari Raya, as Eid is known in the local language, and the aroma of delicious edible specialties, both savory and sweet, fills the air. As the beating of the beduk – a local drum – marks the end of fasting for the day, cannons reverberate with a healthy boom so no one will mistake that it is time for sungkai, the meal to break the fast. Bruneians and foreigners alike throng to the markets and line up to buy curries, satay, kuih and all manner of treats, including these deep-fried bananas. They are handed out wrapped in paper, crispy hot and just the right amount of greasy. The first bite should be taken with care because the sweet banana inside is very hot and once you’ve breached the exterior, steam pours out. But even if you burn your tongue, it’s totally worth it. 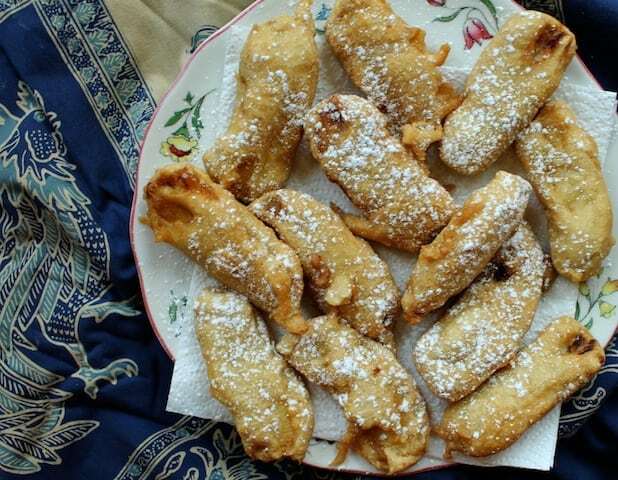 Headnote: Just ripe bananas dipped in a thick batter are deep-fried till golden, creating a crispy outside and a soft sweet inside – a truly delectable treat. Combine your flours, baking powder and salt in a big mixing bowl. Beat your egg with a splash of the water and pour it in the mixing bowl. Keep stirring and adding water until your batter is thin enough to drip off the whisk but still thick enough to cling to a banana. Heat oil in pan or wok over medium flame to about 365°F or 185°C. This is the temperature on my candy/deep frying thermometer which is suggested for doughnuts. Slice bananas in half widthwise then lengthwise. 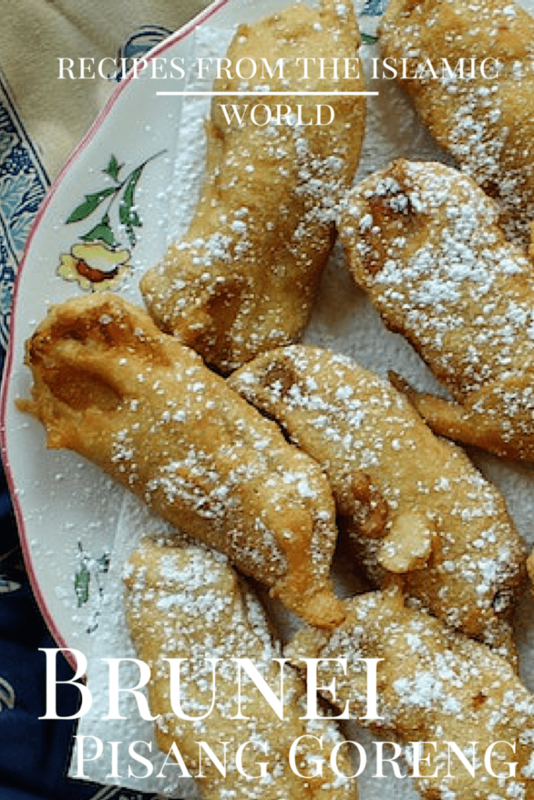 Coat bananas in batter, and deep-fry in the hot oil for just a few minutes, or until bananas are golden brown and crispy. Sprinkle on a little powdered sugar, if desired. I do because I think it looks pretty. Thank you for the invitation to participate in your Recipes from the Islamic World series, Amanda. As it turns out, I have lived in Islamic countries for 17 years of my 29 years of marriage so if you do the series again next Ramadan, count me in again! It was a such a delight to meet you and show you a little of my Dubai in May. Ramadan Kareem! May your blessings be many!